Hi Friends: There is a new challenge today over at the Crafting When We Can Challenges Blog, where the current theme is Mixed Media. Please visit our fabulous sponsor this week, Oddball Art Co, to see all of their wonderful products! My creation for this week is a baby card using the cute image Twinkles - Kawaii Big Eye Unicorn. I used Creative Medium on my background, with lace, metal, markers, and crazing medium on the unicorn. Print image onto smooth white cardstock and color with Spectrum Noir markers. Use dotting technique and crazing medium to add texture to the unicorn. Fussy cut the image, then add Glossy Accents and ultra-fine glitter to the horn and a bit of Glossy Accents on his eye. Layer pink patterned paper from Lullaby collection onto A2 card base and ink edges. Use stencil and pink Creative Medium texture paste to add texture and shine to the background paper - let dry. Ink edges of the Baby sentiment tag from the paper collection, add ribbon and baker's twine and glue to card base. Add trinket pin to ribbon on tag - it looks a bit like a diaper pin. LOL. Add lace to the edges of the card. 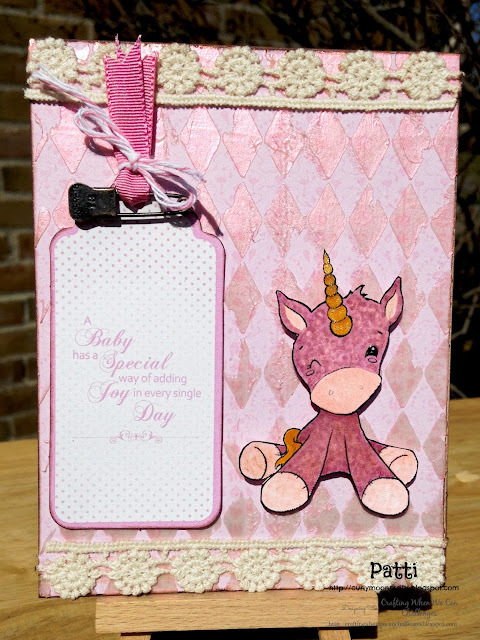 Use foam dots to add the unicorn to the card front.